Does LED Teeth Whitening Really Work? DISCLAIMER: Smile Brilliant understands the function of blue LED lights because we used to sell them! We have since discontinued the sale of such products as our team (and 3rd party research) concluded that the light has little/no impact on the whitening of teeth. WHAT DO BRANDS CLAIM IS THE BENEFIT OF THE LED LIGHT? "LED teeth whitening lighs accelerate the whitening process by causing teeth whitening gel to work faster. Get results fast!" FIRST: HOW DOES TEETH WHITENING GEL WORK? The primary ingredient in teeth whitening gel is generally Hydrogen peroxide or a close derivative called carbamide peroxide. These molecules are made up of hydrogen and oxygen. As the molecule interacts with your teeth the hydrogen and oxygen break apart causing a deep cleaning action. The molecules will become active when exposed to your teeth, higher temperatures, or Ultraviolet light (UV). 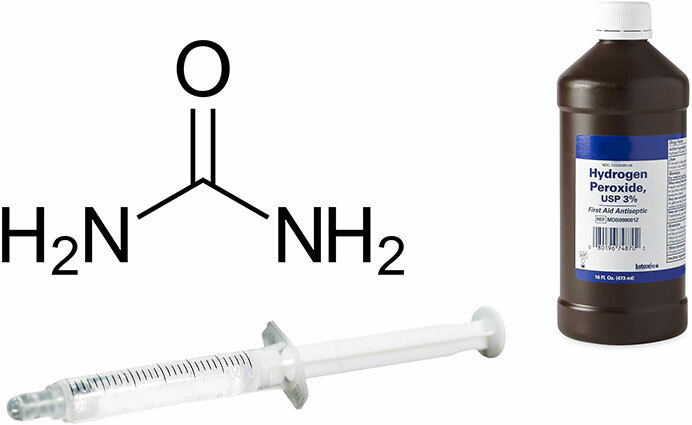 This is the reason that normal hydrogen peroxide (for cleaning wounds) is sold in a brown bottle (eliminates sunlight penetrating the bottle) and the instructions say to store in a cool place. A good quality teeth whitening gel will be fresh (so it has not had time to break down from environmental elements) and is sold in packaging that does not allow light to penetrate. In the case of Smile Brilliant, our teeth whitening gel syringes are individually wrapped in airtight, foil pouches. This eliminates the gel’s interaction with UV light and outside elements. Ultraviolet (UV) light is a frequency of light that is proven to accelerate the whitening process. UV is a frequency of light most often associated with light from the sun, tanning bed lights, greenhouse lights, and in-office dentist "laser" teeth whitening. All of these create the UV frequency known to speed up the activation of hydrogen and carbamide peroxide. In the case of at-home LED teeth whitening, these lights are a simple LED bulb that create a blue colored light. This is NOT UV light! For this reason, it has virtually zero impact on the teeth whitening process. All of the LED teeth whitening companies are purchasing from a handful of manufacturers overseas. We know this because several years ago, Smile Brilliant purchased them. These lights break often and cost less than $3. You can easily verify this by looking at the blue LED light you are considering and then searching websites like Alibaba.com for "LED Teeth Whitening Light". The only laser teeth whitening light that actually works are the UV producing lights that are offered at your local dentist. These in-office procedures use devices that generate the ultraviolet frequency and can dramatically accelerate the whitening process. These devices are FDA regulated and cannot be sold for home use. Further, they can only be used by registered dentists. Although in-office laser whitening is effective, it is expensive and is not an option for people with sensitive teeth. The process will remove more stains quickly but you will be required to make repeat visits throughout the year as you daily food/drink will continue to restain your teeth. Honest dentists will tell you this and suggest that you purchase a set of custom-fitted whitening trays to take home with you. Blue LED teeth whitening is one of the biggest teeth whitener gimmicks that has come online in many years. Our company has first-hand experience in selling these and understanding the lack of value they provide. 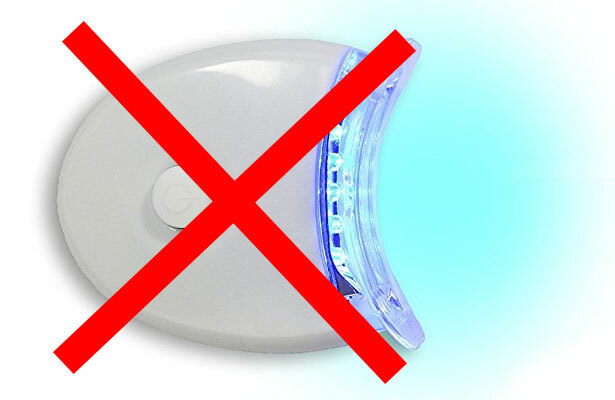 The blue LED lights offered to people for at-home use do nothing to whiten or speed up the price of whitening. This is simply a blue light that does not generate the same UV frequency used in in-office laser whitening. 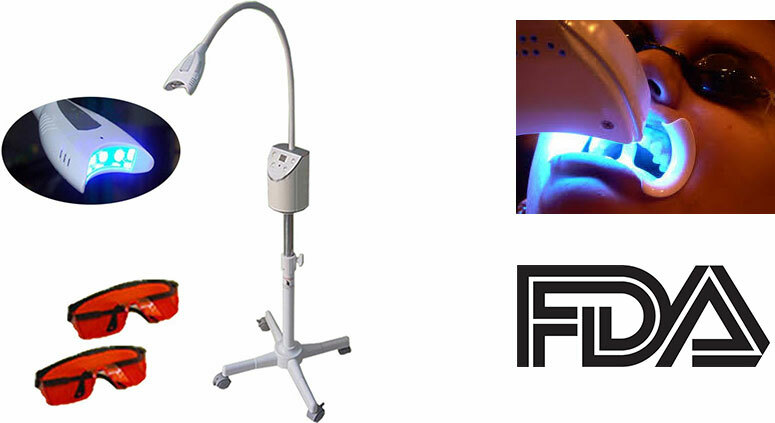 The UV light used in dental offices is effective in speeding up the whitening product but is FDA regulated and can only be administered by a dentist. The best way to get (and maintain) a professionally whitened smile is to use custom-fitted whitening trays and gel offered by your local dentist and Smile Brilliant. The key to getting the best results during your teeth whitening experience is to ensure that each of your teeth maintain a consistent and even coverage for a period of time. No home LED light will speed up this process. For the best results and ease of maintenance, custom-fitted teeth whitening trays are the most highly recommended at-home teeth whitening product by dentists.